cyclists who really want to cycle the whole way from Vienna to Prague. After your arrival in Vienna, the Austrian capital combining modern architecture with the Habsburg empire traditions, make your way individually to Stockerau (40 min by train). Check in and enjoy the evening in this cosy town. After breakfast meet our representative who will introduce you to the tour, give you the bike and all information materials. The first cycling day follows the rolling countryside of Weinviertel (Austrian Wine District) past picturesque Galgenberg Hill encircled with wine cellars. Leave Austria for the Czech Republic arriving at Mikulov with its imposing castle, the Dietrichstein family tomb and the Jewish cemetery where the oldest tombstones date back to 1605. Take a flat dedicated bike path along the Austrian border, then continue on a road through the medieval town of Znojmo to enter Podyji National Park with untouched nature, beautiful views of the deep, forested river valley and the last remnant of the former Iron Curtain. Ride down to the smallest Austrian town of Hardegg and back enjoying the easy crossing of the border. Finish the day descending to Vranov with a Baroque castle perched high on a rock above the Dyje River. A shorter cycling option (41 km / 26 miles), beginning with a morning car transfer from Mikulov to Znojmo is available. From Vranov go up through rolling terrain to visit to a Jewish cemetery in Safov, hidden off the beaten track. Then pass numerous 1930s bunkers on your way to Slavonice, a forgotten Renaissance town with sgraffito houses. From Slavonice ride to Telc, listed as a UNESCO World Heritage Site for its perfectly preserved Renaissance and Baroque town center. A shorter cycling option (48 km / 30 miles), ending with an afternoon train transfer (ticket included) from Slavonice to Telc is available. Cycle through a tapestry of woods and ponds to Cervena Lhota, a beautiful little red chateau in the middle of a pond. Continue through the calm countryside and descend to the Luznice River at Sezimovo Usti, the birthplace of Edvard Benes, the “designer“ of Czechoslovakia and its second president. Finish your day in Tabor, a medieval town founded by the Hussites. Bike up and down the area called “Czech Siberia“ for its unspoiled environment. Enjoy the winding roads and horizons with rewarding vistas before descending to today's highlight, Konopiste Castle. Until 1914 it used to be the estate of Franz Ferdinand d’Este, the Austrian crown prince whose assassination in Sarajevo touched off the WWI. Then it is just a short ride to the town of Benesov. The final part of this bicycle tour takes you via Tynec nad Sazavou, with a 1000 years old castle above the Sazava River, and Krhanice, the site of one of the largest European open air military museums, to Pruhonice, famous for its UNESCO enlisted park with a Romanesque church and a Renaissance chateau. 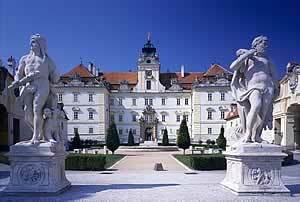 From Pruhonice you will be transferred by car to Prague, the Czech capital.